Print and EFile 1099 MISC & Other 1099 / W2 Forms. Prints on preprinted 1099-MISC forms and W2 forms. Prints 1099 MISC Copies & W2 Copies to blank paper. Exports IRS 1099 MISC forms and W2 forms to Excel. Unlimited W2 & 1099 MISC recipients / payers. Data rollover from previous years. Available for 2018 (2019 tax year), 2017 & before. Create 1099-MISC, INT, DIV, R & W2 in minutes. 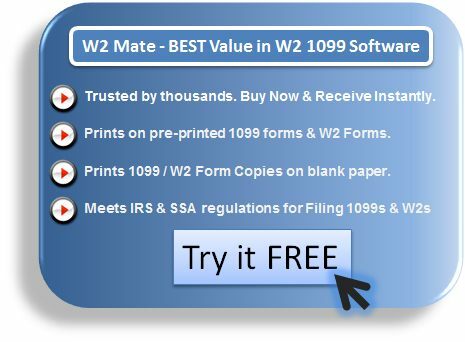 W2 Mate is a powerful W2 / 1099 software that supports a number of forms other than 1099-MISC. This page is dedicated to 1099-MISC, to read about the full capabilities of W2 Mate click here . Start printing now...Order our 1099-MISC Software and receive instantly! 1099 Misc Copy 2: To be filed with recipient's state income tax return, when required. All these form 1099-MISC copies can be printed on blank paper with black ink. Laser Copy A of form 1099 : For Internal Revenue Service Center. Support for an unlimited number of 1099-MISC Filers and unlimited number of employees and 1099-MISC recipients, unlike other W2 and 1099 MISC software applications! Exports 1099 MISC data to Excel format. For a detailed description of this IRS 2018 1099-MISC software and its features, please visit our 1099 tax software page. Box 1. Rents : Use this 1099-MISC box to enter amounts of $600 or more for all types of rents, such as real estate rentals paid for office space. Box 2. Royalties : According to 1099 misc instructions you need to enter gross royalty payments of $10 or more before reduction for severance and other taxes that may have been withheld and paid. Box 3. Other Income: Enter other income of $600 or more required to be reported on Form 1099-MISC that is not reportable in one of the other boxes on the form. Box 4. Federal Income Tax Withheld : Enter backup withholding. Once you are done entering the data for this box (and other boxes) inside our 1099 MISC software, please make sure to click the "Save" button. Box 5. Fishing Boat Proceeds: Please use a 1099-MISC software to enter the share of all proceeds from the sale of a catch or the FMV of a distribution in kind to each crew member of fishing boats with normally fewer than 10 crew members. Box 6. Medical and Health Care Payments: Enter payments of $600 or more made in the course of your trade or business to each physician or other supplier or provider of medical or health care services. Box 7. Nonemployee Compensation: Enter nonemployee compensation of $600 or more. Include fees, commissions, prizes and awards for services performed as a nonemployee, other forms of compensation for services performed for your trade or business by an individual who is not your employee, and fish purchases for cash. This 1099-MISC software provides an exact replica of the original IRS 1099-MISC form (you can easily locate Box 7 and other 1099-MISC fields inside our software). Box 8. Substitute Payments in Lieu of Dividends or Interest: Enter aggregate payments of at least $10 received by a broker for a customer in lieu of dividends or tax-exempt interest as a result of a loan of a customer's securities. Box 9. Payer Made Direct Sales of $5,000 or More: Enter an X in the checkbox for sales by you of $5,000 or more of consumer products to a person on a buy-sell, deposit-commission, or other commission basis for resale (by the buyer or any other person) anywhere other than in a permanent retail establishment. Do not enter a dollar amount in this box. Box 10. Crop Insurance Proceeds: Use this form 1099 MISC box to enter crop insurance proceeds of $600 or more paid to farmers by insurance companies unless the farmer has informed the insurance company that expenses have been capitalized under section 278, 263A, or 447. Box 13. Excess Golden Parachute Payments: Enter any excess golden parachute payments. Box 14. Gross Proceeds Paid to an Attorney: Use this 1099-MISC software to enter gross proceeds paid to an attorney in connection with legal services (regardless of whether the services are performed for the payer). Form 1099-MISC Boxes 16–18. State Information: These 1099-MISC boxes, and Copies 1 and 2, are provided for your convenience only and need not be completed for the IRS. For more information, please see the 1099-misc instructions, which can be easily located inside our 1099-MISC software by going to "IRS & SSA Instructions" menu and clicking on "Instructions for Form 1099-MISC". Difference between a Form W-2 and a Form 1099-MISC? Both of these tax forms are called information returns. The Form W2 is used by employers to report wages, tips and other compensation paid to an employee. The form also reports the employee's income tax and Social Security taxes withheld and any advanced earned income credit payments. The Form W-2 is provided by the employer to the employee and the Social Security Administration (W2 Form Copy A). You can use our w2 software to print and efile w2 forms. A Form 1099-MISC is used to report payments made in the course of a trade or business to another person or business who is not an employee. The form is required among other things, when payments of $10 or more in gross royalties or $600 or more in rents or compensation are paid. The form is provided by the payer to the IRS (1099-MISC Copy A) and the person or business that received the payment (1099 MISC Copy B). You can use our 1099-MISC software to print and efile 1099 MISC forms.